NADL Laboratory Member of the Year - Edmonds Dental Prosthetics, Inc. In January, Steve attended the National Association of Dental Laboratories Vision 21 meeting. Because of Steve’s great leadership, Edmonds Dental Prosthetics was nominated for the NADL Laboratory Member of the Year. 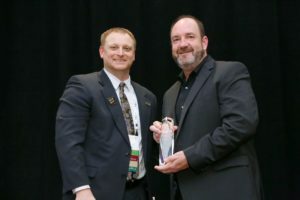 Each year, the NADL presents the award to a member laboratory that makes significant contributions and demonstrates leadership in relation to working in the dental laboratory industry. The NADL Vision 21 Meeting brings leaders in the dental laboratory industry together to learn, share and plan for the year ahead. Those who attend the Vision 21 Meeting are expected to consistently advance their businesses toward positive change. Steve was incredibly honored to receive the award this year. All of us at the lab couldn’t be more proud of how he has helped our company grow in such a profound way. We are grateful to the NADL for presenting Edmonds Dental Prosthetics with the award. And we are also grateful to Steve for helping us achieve this nomination. Without Steve’s focused guidance and dedication to constant improvement, our laboratory likely wouldn’t have won this prestigious award. Steve has the award proudly displayed in the entryway of Edmonds Dental Prosthetics, front and center for all to see. We look forward to what the rest of 2019 brings our company as we continue to strive for greatness and bring you the products and service you can depend on. Read more about the Vision 21 award here! Upon receiving the award, Steve presented a heart warming speech to those attending the meeting. We would love to share the speech with you too. Steve’s speech brought a lot of tears to the audience. If you are at all familiar with the Edmonds family you may shed a few tears too. “It is an honor to accept this award on behalf of the employees at Edmonds Dental Prosthetics. On February 2nd it will be one year since my father, Bob Edmonds, passed away. Bob began his career in the dental laboratory industry with a partner back in the early 70s. In 1981 Bob started Edmonds Dental Prosthetics with a handful of technicians in tow. Today, Edmonds Dental employees number around 150 people. I know Bob is smiling down on me tonight, and I want to let him know that we are still an independently owned family operated company. Two of his granddaughters who said they didn’t want to work at the lab are now carrying on the family tradition. We continue to raise the bar on the quality of restorations we produce. We still search out new technologies and new materials to bring into the laboratory. And we still partner with local charities like Mission of Mercy, the Dental Lifeline Network, and Tooth Truck, to name a few.